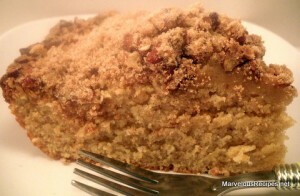 I like this coffee cake best served warm for breakfast with a hot cup of coffee! It also makes a great dessert! 1. Grease a 9×9-inch baking dish or a 9-inch deep-dish pie plate; set aside. 2. In a large bowl, cream the oil and sugar until light and fluffy. Add the eggs, one at a time, beating well after each addition. Beat in vanilla extract. 3. In a medium bowl, combine the flour, baking powder, salt and 1/2 teaspoon ground cinnamon. Add to the creamed mixture alternately with the milk, beating well after each addition. Pour into prepared baking dish. 4. For topping: In a small bowl, combine the flour, sugar and cinnamon. Cut in the butter until mixture resembles coarse crumbs; stir in the pecans. Sprinkle evenly over creamed mixture in baking dish. 5. Bake at 350 degrees F for 55 to 60 minutes or until wooden toothpick inserted near the center comes out clean. Makes 12 servings. This sounds scrumptious! I love coffee cake! Tomorrow, hopefully, is going to be my baking day and this just got added to the list. Have any Pecan Recipes send them to http://www.basspecan.com for a chance to win $1000.